If you’ve spent more than a week reading my blog, you already know that I’m seriously into salads. In fact, I’ve proclaimed my love for the salad bar many times, as it’s a great place to try new things and discover new flavor combinations. This Spicy Mexican Chopped one of my favorite summer salads. Yeah yeah, I know — it’s not summer yet. But pretending that it is and making summer-inspired recipes can’t hurt, right? 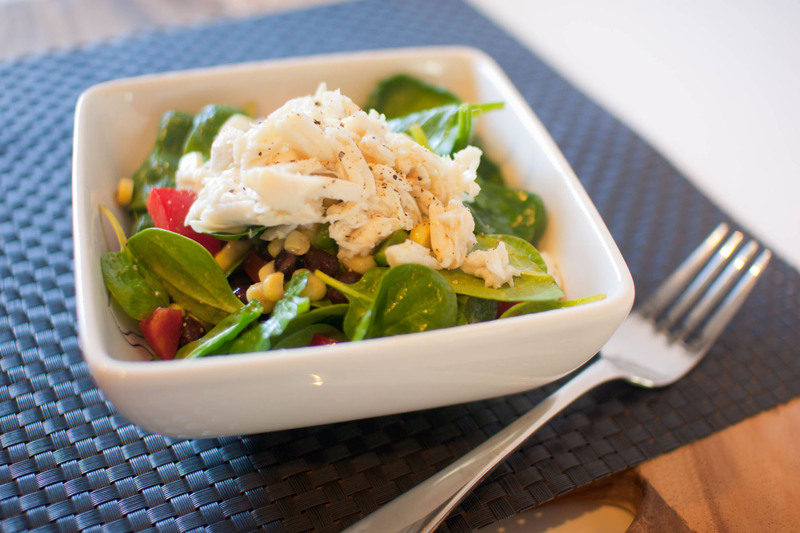 This salad is great topped with grilled chicken or fish, but I thought it would be fun to add crab meat this time — something a bit sweet to balance out the spice from the cumin and jalapeno. 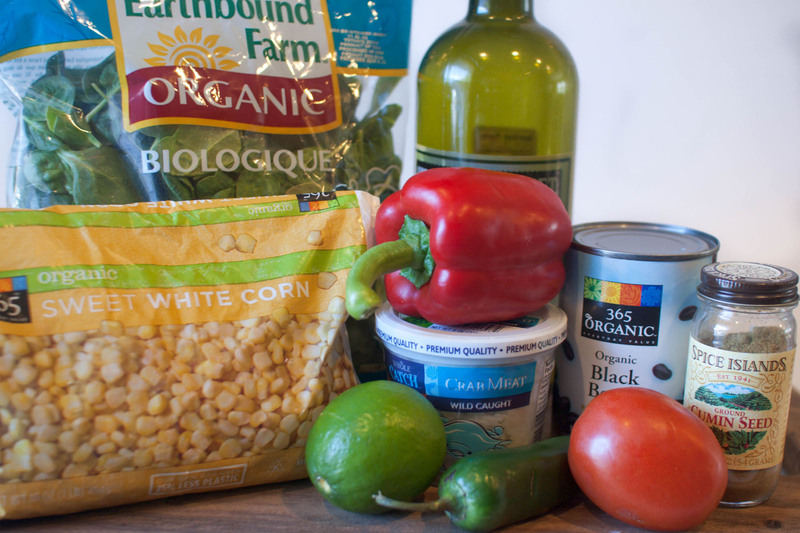 The salad itself (sans crab) is great for picnics and summer parties as it doesn’t have any mayo, cheese or other heat and sun-averse ingredients, plus fresh veggies are always better in the summer anyway — especially corn! So summer, if you could please make your appearance now, I’d be very grateful. Until then, I’ll continue making this salad. XOXO. In a large bowl, combine lime juice and cumin. Whisk in olive oil and season with salt and pepper. Before serving, toss the spinach with the veggie and dressing mixture. Divide evenly into four portions. Top each with the crab meat and a grind or two of freshly cracked black pepper. I know what I’m having for dinner! Thanks for this and all the other amazing meals…you’re keeping us well fed! But I’ll take a bowl of that yumminess…I don’t care if it’s 45 below. I’m also a huge fan of salads. In fact, I have a salad every day for lunch…I’ve been doing that for years now and I can’t imagine a day without my lovely greens. Mmmm…black beans. This looks great for any season if you ask me! I too love salads, and this one looks amazing. 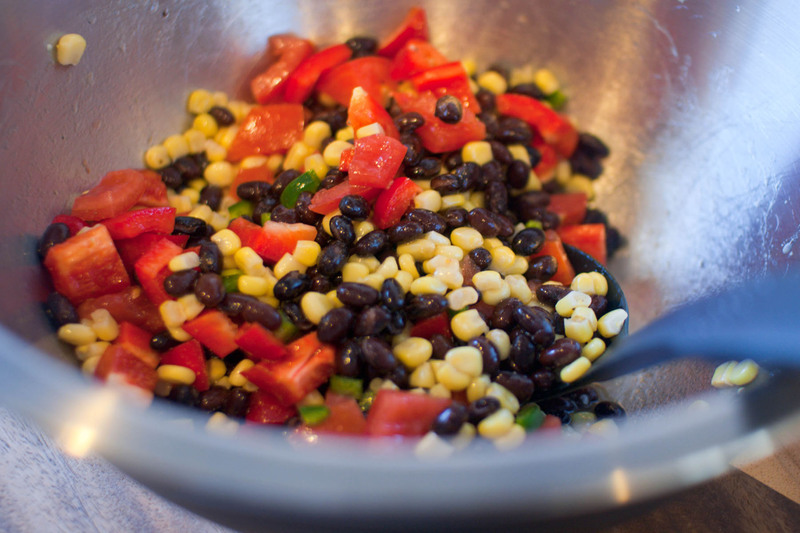 I love the corn and black beans with the crab. YUM! This little salad looks beautiful and fresh! I love crab too! Yum, I love crabmeat! We made a salad like this the other night, but a little more thai than mexican. Looks great! i really have a craving for crab now the sun has arrived in england!